Why did you choose a rescue dog over a puppy? Despite having dogs from puppyhood when I was growing up, I realized the issue relating to over-breeding of dogs with so many unwanted dogs in shelters and being put to sleep. I simply felt that getting a puppy was wrong! We started trawling the websites of rehoming centres, through the hundreds and hundreds of dogs needing homes. We needed a dog that could adapt to different environments, one that would be good with children (as we knew we wanted our own) and, due to our personal circumstances, one that was sociable with people and other dogs. As we looked, we saw that Staffordshire Bull Terriers and Staffie crosses were by far the most common in rehoming centres. Needless to say we ended up with a Staffie – her name is Molly. She is a stunning black and white bundle of energy and love and I have never known a dog to love life and people in quite the way she does. 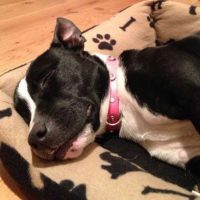 Molly had been handed in as a so-called stray and was thought to be between 6 months and a year old. She had once gone out for a trial rehome but was returned when she came into season. What were the first few days like? Once we took her we knew we had committed ourselves to her for the rest of her life. However, there were inevitable obstacles to overcome. In the same way as you would expect to have to do some basic training with a puppy, we had rehomed a dog who had received no training whatsoever and had been sent from pillar to post in her short life. She had huge amounts of energy, yet had no recall (and we had to build our relationship first before we could let her off-lead), so we had to find ways of channeling this energy. We have a small garden and there are limited securely enclosed spaces available locally. She walked terribly on the lead – she practically bounced wall-to-wall with energy. She got on all the furniture, including the table. She had clearly been poorly socialized with other dogs and didn’t really know how to interact with them appropriately. Most worrying of all she had separation anxiety, so that if I so much as closed the door to the bathroom for 2 minutes, she would sit and cry outside it and wee on the floor. Similarly she would toilet several times when we left her alone at home even for very short periods. However she was also extremely affectionate and willing to learn. She was unfamiliar with the outside world and found joy and excitement in everything! Why didn’t you take her back to the rescue then? We had made a decision to rehome a dog, and whether this was a second-hand dog or a new puppy we had taken on this responsibility and would give our all to teach them and make it work. All the unwanted behaviours took probably less time than it does to train a puppy to resolve, but the separation issues took longer and some patience. We sought help from Rosie and immediately started working on boundary training. We introduced her to a crate and she warmed to her safe place very quickly. Boundary training also helped teach her not to jump on the furniture. We used a longline training lead for recall and it wasn’t long until she had the hang of that, knowing she got treats and plenty of praise each time she dashed back to us! We worked hard on socialising her with trusted dogs. We attended training classes and soon she had simple commands sorted. The thing that took the most patience and a lot of love to resolve was the separation anxiety. Despite it being hugely frustrating for us at times, I knew that the only way to resolve the problem was to provide the stability she needed. Within several weeks we were able to leave her alone in the house for up to 4 hours, having gone from not being able to sleep apart or pop to the toilet. Would you get a rescue again? I would encourage everyone to consider getting a rescue dog- they come with varying levels of challenges or some with very few at all and you can decide what you can handle – you don’t necessarily get this option when you get a puppy. A good rescue centre will be careful to match you to the dog that’s right for you. Don’t forget that puppies have many challenges – we never lost our shoes or skirting-boards to a chewing puppy. We missed out on the cute puppy phase, but really how long does that last? A few weeks before they become lanky adolescents! If you have a rescue dog already and it’s early days, I’d encourage you to seek out other owners of rescue dogs who will no doubt tell you it’ll get easier soon and how worthwhile it is! Rosie also gave excellent and reassuring advice and I would recommend her to anyone. Fill in the form below or visit the Contact Page. Are you an owner or a professional? Transfer the scent of new & existing pets before introducing them visually.